This is the story of TWA Flight 1, a DC-2 that crashed on a mountain top near Uniontown, Pa. on April 7, 1936. 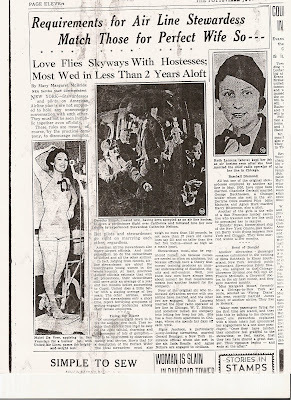 Its also the story of Miss Nellie Granger the Hostess on board the aircraft who was a member of TWA’s second class of air hostesses and her bravery and dedication to her crew and passengers. HER REPORT TO SUPERIORS IN NEW YORK. New York April 7, A transcontinental Western Airliner, carrying 14 persons, crashed near Uniontown, Pa. killing eleven, according to advices received today by TWA main office. The hostess of the plane, Miss N.H. Granger, telephoned the offices here from Uniontown, Pa. and reported the crash. She said that only she and two passengers survived. She said she leaped from the wreckage, suffering principle from shock, and rushed to a nearby farmhouse for aid. After reporting the tragedy she raced back to the plane to give first aid to the two surviving passengers. Among the passengers aboard the plane which left Newark, N.J. at 7:45 a.m. was Mrs. Meyer Ellenstein wife of the Mayor of Newark. Mrs. Ellenstein was enroute to St. Louis. Another prominent passenger was D.D. August, an official of the Revel August Forge Co., of Grove City, Pa. The plane known as “Flight No. 1” made its first scheduled stop at Camden N.J.. It was due at Pittsburg at 10:23 A.M. but was more than three hours over due when the hostess telephoned word of the crash. Earlier it was reported that the plane was having radio trouble and had passed up Pittsburg to continue to Columbus. It was due at Columbus at 11:46 A.M. but it was overdue to there even before the crash became known. On the basis of the hostess report, Chief Pilot Otto Ferguson, and assistant pilot H.C. Lewis were killed. First indicators that the giant airliner, a bi motored Douglas had crashed came from a PWA worker who telephoned from the summit Hotel, near Uniontown, that he had seen a plane fall. He did not identify the plane. Searching parties which started out from Pittsburg earlier were directed to hurry to the scene of the reported crash. Simultaneously, John A. Collings TWA Eastern Division Superintendent, with headquarters in Columbus started from the Ohio terminus to direct searching parties. TWA announced it had talked to the Uniontown Hospital and understood that the passengers who survived were a man and a woman. 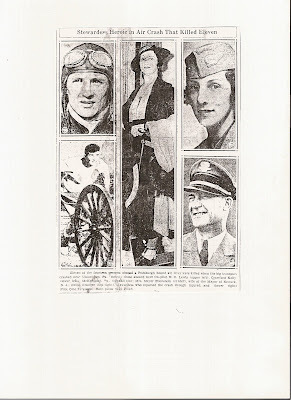 Mrs. Ellenstein was the only woman on the passenger list. 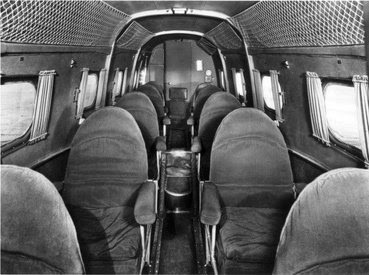 Another report stated that the hostess and a passenger were the only survivors. TWA said it had established contact with a person who resides near the scene of the crash. The resident said the injured would have to be packed 7 miles over mountain trails before a road could be reached despite the fact that the accident happened only four miles south of Uniontown. One theory developed that the pilot got lost in the fog, had gotten on the wrong radio beams between Newark and Pittsburg. Miss Granger went to the farmhouse of Mrs. Ray Adis. BUT DENIED BY FEDERAL OFFICIALS. HEROIC HOSTESS OF CRAFT INDICATES PILOT THOUGHT HE WAS COMING DOWN AT PITTSBURG AIRPORT. Uniontown ,Pa. April 8…The cause of the accident that sent the giant air liner, “Sun Racer”, crashing into a mountain side , killing nine passengers and two pilots, was disputed today by officials of the Transcontinental and Western Air, Inc, and by the Department of Commerce. The crash of the ‘Sun Racer” brought Pennsylvania air fatalities for the first three days of this week to a total of 16. Five U.S. Army fliers were killed Sunday night when their twin motored ship which was carrying them from Pottstown to Langley Virginia crashed and burned in the heavily timbered Blue Mountains near Fredericksburg, Pa. just west of Pine Grove. Both pilots got off their courses and crashed into the sides of mountains. Apparently they both were trying to follow their radio beams because they were flying blind on account of hazardous atmospheric conditions. There was no survivors of the army crash to give an inkling of what caused the crash. Three investigations began while relatives claimed the bodies of the dead in a makeshift morgue in a local hospital. The one survivor in condition to describe the last moments in the planes cabin before it crashed. 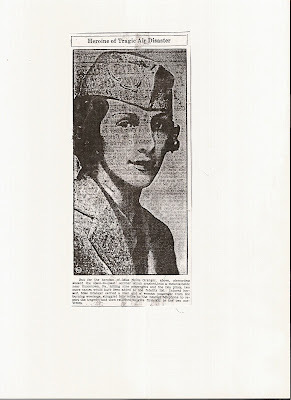 Miss Nellie Granger, the ships stewardess and heroine of the tragedy was guarded in a local hospital by TWA officials and was not permitted to talk to anyone except employees of the company. The other two survivors are in critical condition. Mrs. Ellenstein and Charles C. Challinor, of Cleveland. The plane crashed because a radio beam operated by the department of commerce was not functioning properly, company officials said. The radio beam was functiong perfectly Department of Commerce Officials said. Four inspectors of the departments division of aeronautics set out today to inspect the wreckage in one of three investigations. TWA executives four of whom reached Uniontown yesterday afternoon a few hours after the plane crashed into a mountain at Fairchance, near here, undertook their own investigation. The third was undertaken by the special Air Safety Committee of the Senate. Mrs. Ellenstein was near death, she received a blood transfusion at Mt. Summit Hospital, She had suffered a compound fractures of both legs, deep facial cuts from which she lost a large quantity of blood. Her husband, who came here by plane was at her side. Challinor’s condition was less alarming, though both his arms and one leg had been fractured. Physicians expect him to recover. Miss Granger apparently suffered no injuries in the crash beyond shock, though she was badly scratched and bruised ad her ankles were sprained in her mad dash over six miles of rough mountain terrain to the nearest telephone, where she summoned aid. Miss Grangers story was made available through statements issued by TWA officials in New York, and Chicago. J.B. Walker, TWA vice president in charge of operations made a public third version. Miss Granger herself was in a hospital room where she was still reported suffering from shock. No one was permitted to talk to her. Even her brother had difficulty gaining admittance. Miss Granger told her passengers to adjust their straps (Air passengers are required to strap themselves to their seats when a plane is about to land) and went to the tail of the plane and sat down in her own seat. A minute or so later the plane crashed. She was thrown clear and recovered consciousness” Looking at the sky”. Knitting known fragments together made it appear that pilot Ferguson actually believed he was coming into the Pittsburg Airport some forty miles north of the scene of the crash. At approximately the same time he told Miss Granger he was going to land in “In a few minutes”, he said into his radio telephone. This message was picked up at TWA ground stations at Newark and Pittsburg, was the last word from the plane. More than three hours later Miss Granger frantic voice coming over rural telephone lines to Pittsburg TWA headquarters, announced the tragedy . A slight girl just over five feet tall and weighing 101 pounds, she had demonstrated blind courage. Miss Granger’s story tended to bear out the company’s charges that the radio beam had not been functioning properly deceiving the pilot into the belief that he was near the Pittsburg Airport. The tiny girl still weeping and badly shaken today, displayed the stuff of which legends are made. TWA officials praised her emotionally saying the company had picked her from 200 applicants as of the character and courage befitting a plane stewardess. Mrs. Ellenstein, Challinor and Miss Granger were taken into Uniontown by horse and wagon, the only conveyance capable of negotiating the roads. Rescue parties recovered 11 charred bodies from the plane later and they were brought here by the same means, where they were laid out in the basement of the hospital rented by TWA. Relatives claimed the bodies today. Most tragic of those who came here on sad errands was Mrs. Stanly J. Boyersdorfer, wife of a department store executive. First reports said her husband had been injured. She came with her family physician and his business partner to discover Boyersdorfer had been confused with Challinor. BRAVE LITTLE STEWARDESS GIVES GRAPHIC DESCRIPTION OF PLANE CRASH AND RESCUE. TWA’s heroine stewardess, Little Nellie Granger, height 5’2” weight 101 pounds whished most fervently today that she could stop weeping. The involuntary reaction plus many bruises and scratches and the loss of her petticoat were her personal sufferings from the crash of her air liner yesterday in which she displayed enough courage for a person twice her size. She could do nothing for the nine passengers and two pilots killed out right in the crash of the giant Douglas but had it not been for her the two passengers who came out alive might have been dead. She stumbled, falling at intervals over six miles of rough mountain terrain to summon aid and using her petticoat for bandages ministered to their hurts so efficiently that both may live. 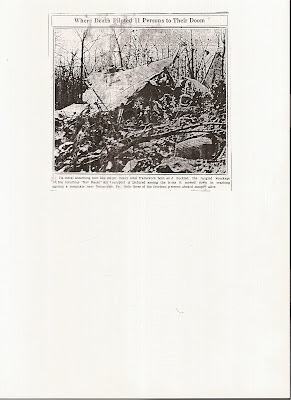 Uniontown, Pa. April 9,…A steady rain delayed complete destruction of the wrecked TWA liner Sun Racer, today and investigators decided to make another check of the twisted airframe. William Cunningham a State Aeronautical Inspector, wafted to apply a torch to the liner which crashed against a mountain side, killing eleven persons. Officials decided to make the last minute check on the possibility some additional information might be disclosed to help them reach a conclusion about the cause of the crash. They still hoped to determine whether the landing gear actually was up or down. After today’s hearings, investigators for the company and other agencies will hear testimony on the radio beam and other technical phases. TWA official P.E. Richter stated” As a result of flight checks made yesterday there is no indication the Pittsburg radio beam is not functioning properly. “We had our chief pilot, Harlen Hull, take a ship out with two Commerce Dept. Men over the Pittsburg Radio Range. From the flight, the day after the accident, the check showed the range was O.K. As a reward Miss Granger has been promoted to Hostess of the lines crack plane from New York to California. She will be taken to New York and then sent to California by boat before resuming her position. PART 2 THE DEPARTMENT OF COMMERCE INCESTIGATION AND REPORT OF TWA FLIGHT 1 "THE SUN CHASER"
On April 7, 1936, at approximately 10:20 a.m., at a point about three miles southeast of Fairchance, Pennsylvania, an airplane of United States registry, owned and operated by Transcontinental & Western Air, Inc., and while being flown in scheduled interstate operation carrying passengers, mail and express, met with an accident resulting in fatal injuries to 12 of the 14 persons on board, injuries to the remaining two persons and the complete destruction of the aircraft. Donald D. August, Grove City, Pa.
George W. Heffermen, Bronx, N.Y.
S. W. Bayersdorfer, Steubenville, Ohio. Crawford T. Kelly, McKeesport, Pa.
C. G. Chanllinor, Cleveland, Ohio. John ONeill, Jersey City, N.J.
C. R. DArcy, New York, N.Y.
Charles H. Smith, New Kensington, Pa. Pilot Otto Ferguson, Kansas City, Mo. Frank Hardiman, Jersey city, N.J.
Mrs. M.C. Ellenstein, Newark, N.J.
Hostess, Nellie H Granger, Dravosburg, Pa. The aircraft, a Douglas, model DC-2, had been inspected and approved by the Bureau of Air Commerce on June 27, 1935, and bore Federal license number NC-13721. It was being operated on April 7, 1936, by Transcontinental & Western Air, Inc., as the Sun Racer, Flight No. 1, Newark, New Jersey, to Los Angeles, California. The pilot, Otto Ferguson, held a Federal transport pilots license and a scheduled air transport rating. The report of his quarterly physical examination taken on March 14, 1936, showed he was in good condition at that time. He was assigned to the Newark-Kansas City Pilot division of TWA as being qualified and authorized to operate scheduled flights over this division, its alternate routes and extension area. The co-pilot, Harry C. Lewis, held a Federal transport pilots license and a scheduled air transport rating. His quarterly physical examination, taken on January 11, 1936, showed that he was in good condition. He was assigned to the Newark-Kansas City pilot division. The airplane left Newark Airport at 7:54 a.m. and arrived at Central Airport, Camden, N.J., at 8:27 a.m. It was cleared from Camden on time at 8:35 a.m., and was scheduled to land at Pittsburgh-Allegheny County Airport at 10:23 a.m. The mountains between Harrisburg and Pittsburgh were for the most part obscured by clouds which extended to a maximum altitude of about 15,000 feet, and there were rain, sleet and general icing conditions in this area. West of Buckstown, Pa., a southwesterly wind of a high velocity was reported blowing at 15,000 feet altitude and the effect of this wind was evident to a decreasing extent at lower altitude. While these weather conditions were not considered hazardous for this type of aircraft operation, they did indicate that on part of the trip the flight would have to be made in or above the clouds, necessitating instrument flying. Therefore, the pilot was authorized by his company to go on instruments at his discretion. Evidence shows that the plane entered the overcast when in the vicinity of Harrisburg, and that Pilot Ferguson continued on instruments to an undetermined point within approximately the last 20 miles of the flight. Before leaving Newark, Pilot Ferguson prepared a flight plan which showed he intended flying from Camden direct to Pittsburgh on a compass course, which is the procedure regularly followed except when weather conditions prevent flying by observation of landmarks. In this event, both the operating manual of TWA and the Department of Commerce Regulations Governing Scheduled Operation of Interstate Air Line Services require that the course must be altered so that the plane follows the right hand side of the Harrisburg radio range and the right hand side of the northeast leg of the Pittsburgh radio range. Proof that the plane was not following the west leg of the Harrisburg radio range is given in Pilot Fergusons radio report that he would cross the south leg of the Bellfonte, Pa., radio range at 9:21 a.m., south of the west leg of the Harrisburg radio range. This crossing was logged by the pilot at 9:30 a.m. and so reported to the TWA ground station at Cresson, Pa., at 9:3l a.m. This definitely places the plane somewhere south of Mount Union; Pa.
Then at 9:49 a.m., the pilot reported crossing the north leg of the Buckstown, Pa., radio range in the A twilight zone of the Pittsburgh radio range, which placed him somewhere south of the northeast leg of the Pittsburgh range. A change was made in the original 9:49 report as recorded by the TWA radio operator at Pittsburgh stating that the plane had crossed the north leg of the Buckstown range on the northeast leg of the Pittsburgh radio range. At 9:50 a.m. employees of the Department of Commerce intermediate landing field at Buckstown, which is two miles west and one mile north of the Buckstown radio range, heard a multi-engined airplane flying slightly south of the field and in a westerly direction. The most experienced of these witnesses, who has been observing aircraft in that area for nearly seven years, gave sworn testimony that the plane was not of the type used by Pennsylvania I Air Lines and Central Air Lines, which operate between Pittsburgh and Washington and with which he declared himself to be familiar. This testimony satisfactorily establishes that the plane referred to by these witnesses was Flight 1, as all other aircraft known to have been in the air and in that area within the period concerned, have bean otherwise accounted for. Further evidence to support the finding of the Bureau of Air Commerce, that the plane was not on the northeast leg of the Pittsburgh radio range, comes from the 10 oclock report from the pilot, in which he estimated, his position as over Chestnut Ridge. This report shows that he was still basing his position estimates on the direct Camden-Pittsburgh compass course and was not using the northeast leg of the Pittsburgh radio range as a course. Otherwise, if he had believed he were on, the northeast leg of the Pittsburgh range and had flown from the point where this leg crosses the north leg of the Buckstown range: to the point where it crosses Chestnut Ridge, only 15 miles in 11 minutes, he would have had to reduce his cruising speed from, about 160 miles per hour to about 82 miles per hour. 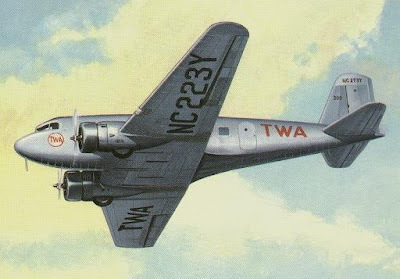 During this 11-minute interval, another TWA plane, Flight 21, bound nonstop from Newark to Pittsburgh and due to arrive there at about the same time as Flight 1, had, according to the pilots log, reported crossing the north leg of the Buckstown radio range on the northeast leg of the Pittsburgh radio range at 9:51 a.m., two minutes after Flight 1 had reported crossing the north leg of the Buckstown range. 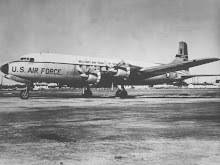 Flight 21 also was Douglas Model DC-2 and of the same general speed and performance as Flight 1. At 10 a.m., Flight 21 estimated its position as over Blairsville, Pa., at the same time that Flight 1 reported its estimated position as over Chestnut Ridge. From this, if it is to be inferred that the two planes were on the same range course, Flight 21 in a short distance had advanced beyond Flight 1 and was leading the latter by several minutes. However, there is no record of a report from the pilot of Flight 1 that he had been forced to slow down or had voluntarily done so. It is therefore concluded that Flight 1 was not on the northeast leg of the Pittsburgh radio range during the interval in question. Flight 21, which was flying on the northeast leg of the Pittsburgh radio range, reached the Pittsburgh air line terminal without difficulty. At about the time Pilot Ferguson was reporting his estimated position as over Chestnut Ridge at 10 a.m., witnesses at Big Springs Summit, which is on Laurel Hill and is about 2 1/2 miles northwest of Bakersville Pa., observed a large, gray, two-engined airplane flying through the lower edge of the clouds, headed west. Big Springs Summit is 24 miles west of the Buckstown radio range and 16 miles south of the direct Camden-Pittsburgh compass course. Then, at 10 09 a.m., Pilot Ferguson reported his estimated position as 10 miles east of Pittsburgh, but at 10:10 a.m. or one minute later, the airplane was heard and seen by witnesses in the vicinity of Connellsville, Pa., which is about 30 miles southeast of the Pittsburgh Airport. At approximately 10:20 a.m. the plane crashed at a point 12 miles east and 39 miles south of the Pittsburgh-Allegheny County Airport, the air line terminal. After leaving Camden, and in accordance with operating procedure, Pilot Ferguson made his first position report by radio to his company station at 9:00 a.m., while flying two miles West of Lancaster, Pa. As be could see the ground, there is no reasonable question as to the accuracy of this particular position. At this point cognizance is taken of the other TWA plane, Flight 21, piloted by R. N. Larson and bound non-stop from Newark to Pittsburgh. Because of a late start, it was due, to arrive at Pittsburgh at approximately the same tine as Flight 1. Whereas Pilot Ferguson crossed the south log of the Harrisburg radio range at 9:10 a.m. Pilot Larson reported that he crossed the north leg of that radio beam at 9:12. This places the two planes running at about 2 minutes apart and because they were converging on Pittsburgh with both flying in or above the clouds, the pilots established radio communication between themselves and agreed that Pilot Larson would fly at 5,000 feet and Pilot Ferguson at 4,500, to preclude any possibility of a collision as their respective courses came closer together. The next report from Flight 1, at 9:2l a.m., was that the plane would cross the south leg of the Bellofonte Pa., radio range, south: of the west leg of the Harrisburg radio range. The crossing was logged by, the pilot at 9:30 a.m., and so reported to the TWA ground station at Cresson, Pa., at 9:31 a.m. This message definitely showed that Pilot Ferguson, navigating entirely by instruments, was flying a direct compass course and was not using the west leg of the Harrisburg radio range as a course as is required under these circumstances. It places the pilots intended course as somewhere south of Mount Union, Pa. Flight 21 reported crossing the south leg of the Bellefente radio range at 9:31 a.m. a minute later. There is no occasion to doubt the accuracy of these reports. This correction, which materially changed the originally recorded position of the airplane, may have been the result of the TWA radio operator at Pittsburgh confusing a call at 9:51 a.m. from Pilot Larson of Flight 21, who reported crossing the north leg of the Buckstown radio range on the northeast leg of the Pittsburgh radio range. The Bureau of Air Commerce believes that the originally recorded position report from Flight 1 is as Pilot Ferguson communicated it. Also, the originally recorded message more accurately defines the position at which the pilot expected to be, according to his flight plan and previous position reports. There was no record of Flight 21s 9:51 position report at the Pittsburgh TWA ground station, although there is a record in Flight 21s log that such a report was made Pilot Larson so testified at the public inquiry. As previously stated, at 10:00 a.m., Pilot Ferguson estimated his position as over Chestnut Ridge at an altitude of 3800 feet, and so reported. At the same time, Flight 21 reported its estimated position as over Blairsville at an altitude of 4500 feet. The last radio report from Flight 1 of record was at 10:09 a.m., and was to the airport control tower at Pittsburgh. The pilot gave, his estimated position as 10 miles east of Pittsburgh his altitude as 3,000 feet, and on instruments. At this time Pilot Ferguson asked for positions of other airplanes and for clearance to land. The requested information and clearance to land were given, and in acknowledging its receipt, the pilot told the control tower, You are very weak. Nothing more was heard from the plane until about l:55 p.m., when the air hostess, Miss Granger, telephoned the Pittsburgh office of TWA that the plane had met with an accident at a point near Fairchance. Meanwhile, Flight 21 appeared over the Pittsburgh-Allegheny County Airport on instruments at approximately 10:23 and landed at 10:30 a.m. The airport ceiling it this time and during the previous half hour was 1700 feet. The first reports from witnesses on the ground tending to show that Flight I was not on the radio range courses marked by the Harrisburg and Pittsburgh stations (which already has been shown by the planes position reports) or even on the compass course which the pilot intended to fly, came from witnesses at the Buckstown Department of Commerce intermediate landing field. Their testimony already has been referred to in the forepart of this report. At a time given as between 10 and 10:30 a.m., witnesses at Big Springs Summit saw what is believed to have been Flight 1 flying west through the lower edge of the clouds The altitude of Big Springs Summit is 2900 feet. Subsequent events indicate that the plane passed over Big Springs Summit at approximately 10:00 a.m., at which time Pilot Ferguson was reporting his estimated position as over Chestnut Ridge at 3800 feet. The path of flight, based on the Buckstown and Big Springs Summit observations, shows a consistent compass bearing from the point where the flight went on instruments, which was in the vicinity of Harrisburg. This flight path deviates approximately 8 degrees south of the course indicated on the pilots flight plan. The airplane was again heard and seen by witnesses in the vicinity of Connellsville, which is about 30 miles southeast of the Pittsburgh airport, at approximately 10:10 a.m. (At 10:09 the pilot had reported his estimated position as 10 miles east of Pittsburgh.) Its flight path at this point was southwesterly, passing about 2 1/2 miles due east of Connellsville, at a low altitude. The ground elevation there is approximately 1900 feet. It is also apparent from the evidence obtained near Connellsville, that the pilot had descended a considerable amount, which is confirmed by his radio reports, the last one of which placed his altitude (above see level) as 3,000 feet, and that he may then have been trying to identify landmarks in this vicinity instead of flying solely by instruments. Testimony of witnesses throughout the remainder of the flight shows definitely that the airplane continued, in a general southerly direction, passed to the east of the Summit Hotel (on Chestnut Ridge near Uniontown, Pa.), to a point about two miles northwest of Elliotsville Pa., and headed westerly up a small valley in the general direction of Fairchance. Throughout this portion of the flight the airplane was flying just over the tree tops and the pilot was obviously trying to keep the ground in view while veering to avoid higher hills. A light freezing rain was falling at the time and low clouds end fog obscured the tops of the surrounding mountains. At the point where the airplane turned west up the small vallely, its altitude was estimated by witnesses, as approximately 100 feet above the ground, and at that height it could only be seen intermittently. This valley is a ravine on the southeast side of Chestnut Ridge which curves toward the north and ascends as it approaches the summit. Apparently at the end of the ravine the pilot was suddenly confronted with the ridge directly ahead, the top of which evidently he could not see, due to fog and clouds. A check of this terrain relative to the altitude at which the airplane was seen to be flying just previously shows that, to clear the ridge, the plane would need to, climb 650 feet in approximately three-quarters of a mile. This climb, turning to the right with the ravine, took the airplane into the low-hanging clouds, thus further obscuring the pilots vision. At a point approximately on top of the ridge the airplane, still turning to the right, struck a series of trees and Came to a stop about 1200 feet beyond the first tree hit. The evidence indicates that there was no malfunctioning of the aircraft, engines or equipment. While general icing conditions were present, the plane was equipped with devices to remove ice formations from the wings, tail and propellers, and there is no evidence that ice affected its flying characteristics. Further, there was sufficient fuel aboard for more than two, hours flying at the time of the impact and there is no evidence that the pilot was attempting a landing. The two Pittsburgh radio ranges were flight checked by a Bureau of Air Commerce radio test pilot on March 29 and the characteristics common to these radio ranges located in mountainous country, were published by the Bureau in a Notice to Airmen dated April 1, six days before the accident, and made available to all air lines operating through Pittsburgh, including TWA. Further there is evidence that TWA pilots on this run are and have long been familiar with these general characteristics. My beam reception from Buckstown in was o.k. I had no trouble. Pilot R.S Leroy, of the Pennsylvania State Division of Aeronautics, left Pittsburgh at 9 a.m. for Harrisburg and flew out on the northeast leg. Because of icing conditions, and no special do-icing equipment on his airplane, he returned to the airport after being out about 20 minutes. In this flight he used the right hand side of the beam going out and the right hand side coming back and reported no difficulty. Pilot Horace Starke, of Central Air Lines, flew into Pittsburgh on the northwest leg of the Pittsburgh radio range from Akron, Ohio, and landed at 9:37 a.m. He reported the range very good. When he landed, Pilot Ferguson was then somewhere between the south leg of the Bellefonte and the north leg of the Buckstown radio ranges. Pilot Harry L. Smith of Pennsylvania Air Lines left Cleveland at 8 32 a.m. and arrived at Pittsburgh at 9:27, using the northwest leg of the Pittsburgh radio range. He departed for Washington at 9:44 a.m. and followed the southeast leg of the beam until 10:38 a m. - - a period during which the accident occurred. He testified; Our radio been reception was satisfactory all the way. He crossed the south leg of the Buckstown range at 10:19 and arrived in Washington at 11:15 a.m. Pilot John H. Neale, senior pilot of Pennsylvania Air Lines, left Washington at 8:35 a.m., and testified he flew the southeast leg of the radio range into Pittsburgh on top of the clouds and: arrived over the Pittsburgh airport at 10:00 a.m. He said he used the southeast leg for guidance and I didnt notice any unusual characteristics. Because of icing conditions beneath he decided to proceed to Cleveland where he landed 15 minutes overdue, which I attribute to winds, he said. He testified he crossed the Buckstown range at 9:27 a.m. above the clouds. Pilot E W. Day, of Central Air Lines, testified he left Washington at 9:10 a.m. and shortly thereafter he picked up the Pittsburgh beam. He crossed the Buckstown beam on instruments between 7,000 and 10,000 feet at 10:03 a.m., and because of heavy icing conditions at his present and lower altitudes, he endeavored to reach the top of the clouds which were more than 16,000 feet. In this endeavor, he encountered strong winds from the southwest, was blown to the northeast and eventually landed at Erie, Pa., at 1:10 p.m. Because of his efforts to get away from the ice and to surmount the high cloud banks, he said he used the Pittsburgh beam very little. The foregoing testimony accounts for all four legs of the Pittsburgh radio range while Pilot Ferguson was in the air. Also, in all cases the airmen testified they were tuned to the new station, although the older one was in operation at the same time and was available at their option on another frequency. The bureau of Air Commerce monitoring stations at Cambridge and Cleveland, Ohio, reported no swinging of the Pittsburgh radio range courses during the period Flight 1 was in the air. An analysis of the evidence obtained by the Bureau of Air Commerce, both at the scene of the accident and at public hearings conducted at Uniontown and Pittsburgh, makes it apparent that the pilot, following a straight compass course out of Camden for Pittsburgh, continued this compass course after it became necessary for him to resort to instrument flying in the vicinity of Harrisburg, and that he did not proceed to and follow the course marked by the west leg of the Harrisburg radio range and the northeast leg of the Pittsburgh range. There is no evidence placing the plane on these radio courses either by witnesses or by a radio report from the plane announcing a change in the flight plan. It is further apparent that from Harrisburg west, the pilots correction for cross-wind drift was in error because the actual course he flew was approximately 8 degrees to the south of the intended course and the one he believed he was following. The south and north logs of the Bellefonte and Buckstown radio ranges respectively, which crossed his course at approximately right angles, would give the pilot checks on the westerly progress of the flight only, and were used by him for this purpose. However, they would not be expected to disclose a small amount of drift to the north or south. As a result of this deviation from the intended course, the airplane, according to witnesses, passed south of the Buckstown field at a point approximately 15 miles south of the intended course and apparently without the pilots being aware of this discrepancy. After the Buckstown crossing Pilot Ferguson continued the same course he had been flying which actually was south of the route he thought he was following. Consequently, he crossed the southeast leg of the Pittsburgh radio range at a point about 35 miles southeast of Pittsburgh. A few moments later he altered his course to the southward, obviously thinking that he had just crossed the northeast leg of the Pittsburgh radio range. This change of course to the southward, indicates conclusively that Pilot Ferguson believed he had crossed the northeast leg instead of the southeast leg. To determine which of the two legs he had crossed, it Was necessary for him to make some kind of a turn, since the signals in crossing either leg from the A zone to an N zone are Or Course (represented by long dash) and N (dash dot). If there had been any reason for the pilot to assume he had just crossed the southeast leg, the turn which ho normally would have made to check his position would have been naturally to the right or northward after crossing the leg, since this direction would bring him back onto the southeast leg. After a few minutes flying in a southerly direction and at approximately 10:09 a.m., he reported his position as 10 miles east of the air terminal at Pittsburgh, a natural conclusion since he believed he had crossed the northeast leg of the Pittsburgh range and was still, basing his calculations on ground speeds made between previous check points. However, as the time of the crash is fixed at approximately 10:20 a.m., the airplane could not have flown from the reported position 10 miles east of the Pittsburgh air terminal to the point of the accident - a distance of about 45 miles, at an altitude of 3,000 feet or lower where no helping winds existed, and over the route reported by witnesses - in 11 minutes, as this would have required a speed substantially in excess of the maximum attainable speed of the airplane. Therefore, the conclusion of the Bureau of Air Commerce is that the airplane was much further south and east of the position Pilot Ferguson reported at 10:09 a.m., and that he never reached the position he had calculated. This is supported by the fact that the: pilot reported the signal strength of the Pittsburgh radio control tower as weak, which would be expected at a point as far away as Connellsville ( where the plane was seen and heard at 10:10 a.m.), nearly at the limit of the transmitting range of the Pittsburgh airport radio control tower. When Pilot Ferguson discovered he was off his course, either by visual observations or signals from the radio range which told him definitely that he was in the N zone south of Pittsburgh instead of the N zone north of the airport as he may initially have assumed, the airplane was flying at a low altitude, following the main valley along the east side of Chestnut Ridge. He evidently concluded to continue at a low elevation and keep the ground in sight, until he could determine his exact location or find an opportunity to head west out of the mountains and into better weather conditions. This latter procedure brought him into the ravine with fatal results. It is the opinion of the Bureau of Air Commerce that the probable cause of this accident was poor judgement on the part of Pilot Ferguson for flying by visual ground observation methods after having descended through the clouds and overcast in mountainous terrain at a point unknown to him. Because of clouds and poor visibility this, required flying close to the ground whereas the safest method under such circumstances is to climb into or above the overcast to a safe altitude and determine the location of the plane by instruments and radio. Failure of the pilot to identify accurately his position with respect to the Pittsburgh-Allegheny County Airport before descending through the overcast in preparation for his scheduled landing. Failure of the Pilot to proceed to and follow the right hand side of the west leg of the Harrisburg radio range course when it first became necessary for him to resort to instrument flying in the vicinity of Harrisburg due to weather conditions and failure to complete his flight on the right hand side of the northeast leg of the Pittsburgh radio range, as provided for by both Department of Commerce and TWA regulations. Fascinating and intriguing stuff. My paternal grandfather S.W. Bayersdorfer died on this flight. His daughter Ruth age 86 (my aunt) and son Stanley age 82(my father) are still living in Louisville, KY.
Would love to hear from other relatives of those involved.